Using Qt XML Patterns to validate XML with a W3C XML Schema. 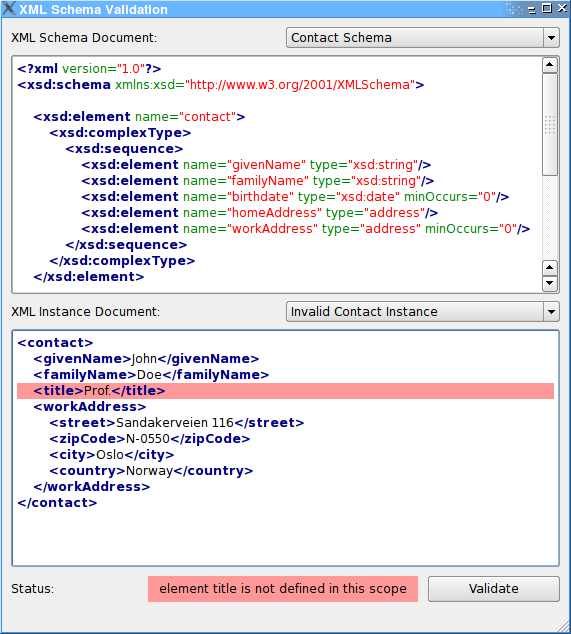 The XML Schema Validation example shows how to use Qt XML Patterns to validate XML with a W3C XML Schema. The example application shows different XML schema definitions and for every definition two XML instance documents, one that is valid according to the schema and one that is not. The user can select the valid or invalid instance document, change it and validate it again. The UI consists of three parts, at the top the XML schema selection and the schema viewer, below the XML instance selection and the instance editor and at the bottom the validation status label next to the validation button. You can select one of the three predefined XML schemas and for each schema an valid or invalid instance document. A click on the 'Validate' button will validate the content of the XML instance editor against the schema from the XML schema viewer. As you can modify the content of the instance editor, different instances can be tested and validation error messages analysed. The constructor fills the schema and instance QComboBox selections with the predefined schemas and instances and connects their currentIndexChanged() signals to the window's schemaSelected() resp. instanceSelected() slot. Furthermore the signal-slot connections for the validation button and the instance editor are set up. The call to schemaSelected(0) and instanceSelected(0) will trigger the validation of the initial Contact Schema example. In the schemaSelected() slot the content of the instance selection is adapted to the selected schema and the corresponding schema is loaded from the resource file and displayed in the schema viewer. At the end of the method a revalidation is triggered. In the instanceSelected() slot the selected instance is loaded from the resource file and loaded into the instance editor an the revalidation is triggered again. The validate() slot does the actual work in this example. At first it stores the content of the schema viewer and the editor into temporary variables. Then it instanciates a MessageHandler object which inherits from QAbstractMessageHandler and is a convenience class to store error messages from the XmlPatterns system. The rest of the code does only some fancy coloring and eyecandy.